While hunting around last weekend on ebay for some cards, I came across an interesting buy it now/make offer card. It was a black printing plate of my favorite PC player for a great price. I looked at it right away, and told myself that I'm trying to build a 76-77 OPC set and should be focusing on those. Shipping was $3, so I decided to offer $12 (I didn't want to go too cheap and offend the guy). 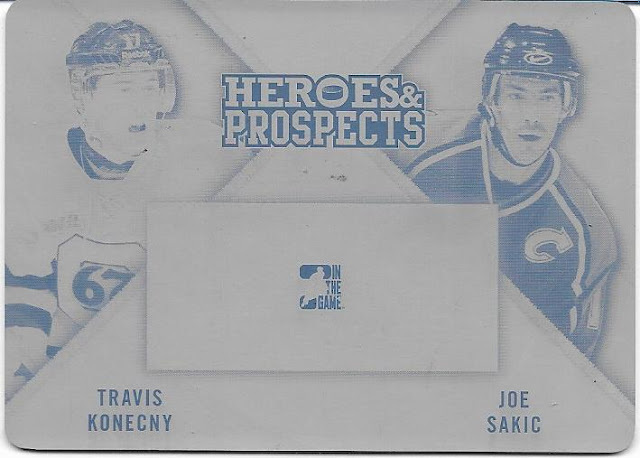 He accepted quickly and now I have a great piece for my Joe Sakic PC. I told my better half about the card and the great price, and the first thing she says is "do you have the actual card to go with it? We could put them both in a frame and hang them on the wall." So I'm looking for the jersey card to go along with this. There are a couple of copies on ebay for $30 shipped, so I'm going to hold off a bit until I can find something cheaper. No hurry though, there's plenty of time for frivolous stuff like that. Watch it. Soon you'll try to collect the rest of the plates to go along with the one you already have.